Ted Carmichael Global Macro: Equities Rebound: Is It Safe? Equities Rebound: Is It Safe? This post asks the question: "With global equities rallying back, "Is It Safe?" to take an aggressive position in risk assets. To set the mood, you might (or might not) want to watch this clip of Dustin Hoffman and Laurence Olivier in the movie Marathon Man. In the last few posts, I have been writing about the sell-off in asset markets that began after Fed Governor Janet Yellen spoke at the Jackson Hole conference at the end of August. Yellen's speech was balanced and this spooked markets into thinking that the Fed might tighten sooner than expected. I referred to this concern as "Exit Ennui" and compared it with the selloff in asset markets that occurred in the May 2013, the so-called "Taper Tantrum". Bonds, commodities, high yield credit, EM equities and US small cap stocks all sold off over the first three weeks of September, while US and other DM stock markets held up well. However, in mid-September, signs of slower global growth, including falling crude oil prices, caused the sell-off that started with Fed tightening concerns to shift to global equity markets and a sharp correction followed. Commodities continued to sell off but bonds rallied back, with the 10-year US Treasury yield falling to 2.15%, its lowest since prior to the Taper Tantrum. The low point for equities was reached on October 16. On that day, equity markets turned higher when St. Louis Fed President James Bullard suggested that the Fed should consider extending QE, "to make sure inflation and inflation expectations remain near our target". The Bank of England's Chief Economist followed the next day with a suggestion that weak global growth should perhaps keep the Bank of England from raising its policy rate for an indefinite period. Since then, equities have roared back and bonds have given back some of their gains. 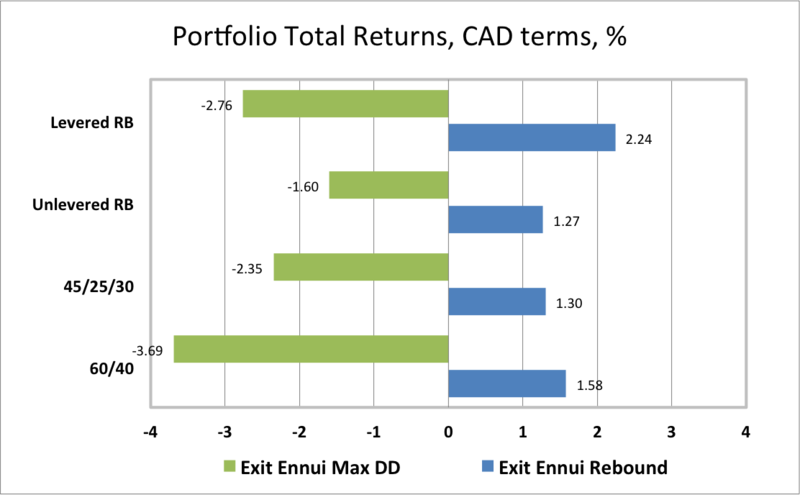 The chart below, using weekly closes, shows the maximum drawdowns since August 29 (in Canadian dollar terms) for the ETFs regularly tracked in this blog and their subsequent rebounds. The largest declines were in Canadian equities (XIU), commodities (GSG), Eurozone equities (FEZ) and Emerging Market Equities (EEM). Gold (GLD), US small cap equities (IWM) and Japanese equities (EWJ) also saw large drawdowns. 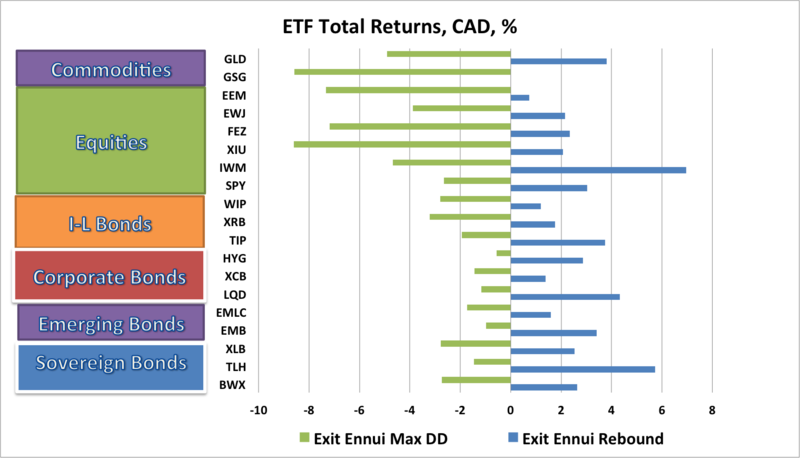 In fixed income ETFs, the largest drawdowns, which occurred in the first three weeks of September, were in Canadian inflation linked bonds (XRB), Canadian Long Bonds (XLB) and non-US Developed Market government bonds (BWX). Corporate bonds had the smallest drawdowns. What about the rebound? Which assets have performed best? The strongest rebound has been in US small cap equities (IWM), followed by US long Treasury bonds (TLH). Both of these ETFs have more than recovered from their drawdowns. Which assets have lagged in the rebound? Commodities have continued to flounder, not yet having found a bottom, although there were tentative signs of a rebound this week. With commodities not rebounding, Candian equities (XIU) and Emerging Market equities (EEM) have lagged other equity ETF rebounds. In fixed income, US long Treasury bonds (TLH) and US investment grade corporate bonds (LQD) have led the rebound, while emerging market local currency bonds (EMLC) have lagged. While the Exit Ennui drawdown has been the biggest correction of 2014, the "buy the dip" mentality is clearly alive and well. The portfolios we track hit their weekly lows on October 10. With Bullard's help they have rallied back, but all remain lower than their August 29 levels. The question now is: with equities having rallied back, "Is it Safe?" to take a more aggressive position on risk assets. The answer is probably yes, but still with great caution. Equities are still overvalued by reliable metrics, although a bit less so than at the end of August. Q3 earnings reports are coming somewhat mixed, but do not yet show signs of any surprising weakness. Bonds, which were already overvalued in late August, are now more overvalued and are at risk of giving back their recent sharp price gains if US economic data remain on the strong side. What investors need to be wary of is a series of bond sell-offs which trigger equity sell-offs. This would be the reverse of the pattern witnessed throughout the period of increasingly accommodative monetary policy as measured by the growth of the balance sheets of the US Fed and other major central banks. "We've been floating this market with the Ritalin of easy monetary policy… indiscriminate investing took place ... all boats rose regardless of underlying value... People will actually have to do work ... have to understand analysis in order to make good investments." So, "Is it Safe?" If the Marathon Man doesn't know, who does?